A cornerback for the Tennessee Titans chose OffLeaseOnly for his newest ride! It was a sweet score for everyone involved! 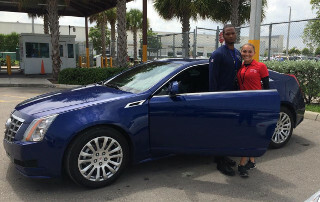 Ri’Shard Anderson bought a Cadillac CTS Coupe but was so unassuming that OffLeaseOnly Miami sales associate Amy Williams didn’t know he was a pro football player until someone in Finance mentioned it while reviewing his credit application. “I don’t tell people I play football,” the soft-spoken player told Williams when she asked him about it. Tennessee Titans Cornerback Ri’Shard Anderson and OffLeaseOnly sales associate Amy Williams with Anderson’s OffLeaseOnly Used Cadillac CTS. “I’m not like that,” the modest Anderson said later. Williams said she was available when Anderson came into the Miami dealership. He walked over when she stood up and subsequently became the first NFL player to whom she has ever sold a car. The Tennessee Titans signed the 5’11” Anderson as an undrafted free agent on May 12, 2014. The 24-year-old will be playing his second season this year. 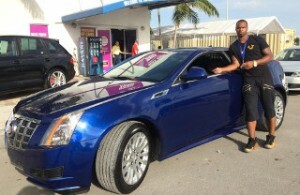 Anderson purchased a gorgeous blue OffLeaseOnly used Cadillac CTS Coupe. Williams said it was fun helping Anderson find a car that was the perfect fit and in typical Off Lease Only fashion, this particular car was priced $7,000-$8,000 less than every other dealer in the market. Originally from Miramar, Anderson attended Miramar High School for one year, then switched to American Heritage High School in Plantation. He subsequently attended college at Syracuse University, where he played football. Anderson graduated with a degree in hospitality management in Spring 2014. Tennessee Titans cornerback Ri’Shard Anderson shows off his 2012 OffLeaseOnly used Cadillac CTS Coupe. Anderson said he went car shopping at OffLeaseOnly after a friend suggested he take a look. He liked what he saw, and after checking out an Audi and a Jaguar, he chose his Cadillac. He loved the beautiful blue color. Anderson was impressed that OffLeaseOnly actually had the inventory on site that it advertised. Anderson will be heading up to Tennessee for the upcoming football season in about three weeks. He plans to tell his family, friends, and yes, his teammates, about his car buying experience at OffLeaseOnly. For now, he’s looking forward to taking his 4-year-old daughter Azariah for a ride in his pristine pre-owned Cadillac CTS Coupe! Amy and everyone at Off Lease Only wish Anderson and the Titans much luck on the upcoming season! TITAN UP! To further assist customers in their used car buying experience, Off Lease Only has launched a NEW OffLeaseOnly Reviews Site which aggregates reviews from Yelp, Google, Edmunds, Cars.com, DealerRater and OffLeaseOnly in one convenient location. The purpose of the site is to make it even easier for potential customers to read reviews and find out what the experience is like first hand from our customers. Next Story → OffLeaseOnly Sales Personnel Walk Miles to Sell Used Cars!